YES we had to get the song out of our system as TCS Arts returns with a surprise prototype! Thailands Chawalit Siribundasak of TCS Arts who brought you all the fantastic ” Shark Fat’tack” Daddy Shark has become a parent, HA. Meet Baby Shark. Whist finishing up on the productions for Shark Fat’tack Chawalit wanted to test out the idea of a baby version and now he’s here. 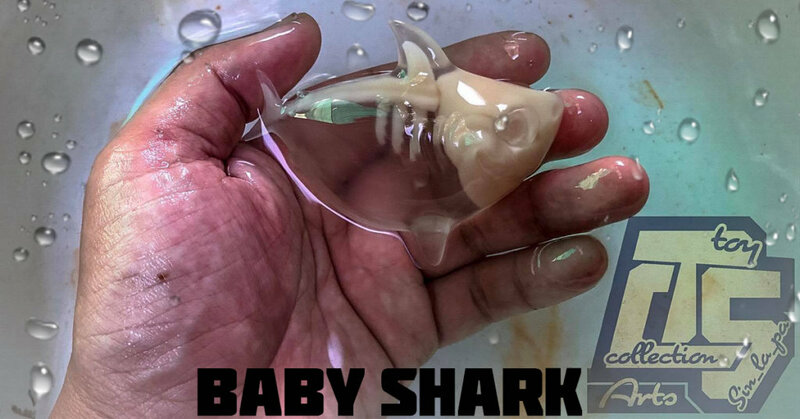 Just like the Shark Fat’tack and Turtle , baby Shark features double casting. We don’t know about you, but we will definitely keeping a close eye on TCS arts as he quotes “Will focus on animal series. Aquatic, reptiles, terrestrial animal and monster” ticks all our boxes. What animal will be next on TCS Arts? No news when or if Baby Shark will be released, but fingers crossed it will. Stay tuned for further updates. Find TCS Arts on Facebook and now on Instagram.